The National Summer Transportation Institute (NSTI) program is administered through the Federal Highway Administration’s Civil Rights Division with the intent of garnering interest and developing the next generation of transportation professionals. The Transportation Research and Education Center (TREC) at Portland State University (PSU) in partnership with Oregon Department of Transportation held their first Summer Transportation Institute in 2016. The TREC Summer Transportation Institute was created with the goal of introducing high school girls to the breadth of transportation related careers. TREC developed a program with three central objectives: (1) to introduce students to transportation related careers, (2) to encourage students to consider transportation-related fields of study in their higher education pursuits, and (3) to encourage students to use and connect STEM-skills with the wider field of transportation. For two weeks, 22 high school girls from 14 different schools in the Portland Metro area participated in classroom and hands-on instruction with transportation professionals from various sectors. Their days included instruction from industry professionals, STEM curriculum in all modes of transportation, experiential learning (labs, field trips, tours), and curriculum designed to help them locate themselves and their communities within the larger socio-political context of transportation. A tour of Portland using a variety of transportation modes (walking, MAX, bus) hosted by Know Your City. 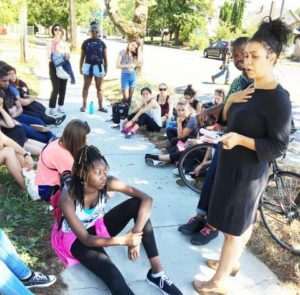 This tour took students to sites where transportation infrastructure development had impacted displacement of historically Black neighborhoods including Rose Quarter, Dawson Park, One North Development, Sons of Haiti, Unthank Park, the North Williams bike lanes, and the historic site of Vanport. Students learned how to use GIS to map crashes with Portland State University transportation researchers. Students toured TriMet’s Orange Line and discussed the different people and systems that collaborated to create Portland’s latest MAX line, including artists and engineers. Students were also able to tour TriMet, experience a bus simulator, and see the master board for all of the MAX trains. Students were given the opportunity to beta test Portland Public Schools new Safe Routes to School smartphone app. Students used the app to find walking routes to their neighborhood schools and learned about crowd sourced data that is used to determine walk route conditions. Girlstrength, a program hosted by the Portland Police Bureau, taught students about personal safety and self-defense on public transit. A session on transportation and the environment was taught by OPAL Environmental Justice. A hands-on activity using salt water taffy (used to signify pollution) was used to teach students that fairly mitigating pollution is a difficult task. “We gathered a group of girls whose skills in STEM subjects was strong, and whose interest in transportation was nascent. By connecting their STEM knowledge to their fundamental roots in their communities and to their own identities, we laid the foundations to develop a cohort of well-rounded and firmly grounded future leaders,” said Sarah Dougher, 2016 NSTI Program Director. TREC will be hosting the program again this summer. For more information about this program, click here.